Located in a metropolitan area of 1.7 million people, Columbus State is a vibrant and diverse educational institution with an enrollment of more than 26,000 students. Minutes from the airport and The Ohio State University, Columbus State is in the heart of Columbus, Ohio with its growing international population and cosmopolitan atmosphere. Columbus State serves students from over 100 countries in its college credit courses and non-credit programs. Columbus State, showcasing the countries and cultures that make up our community. Seeking vendors and performers. Want to showcase your country or culture at the World Bazaar? Or volunteer to help make the event a success? 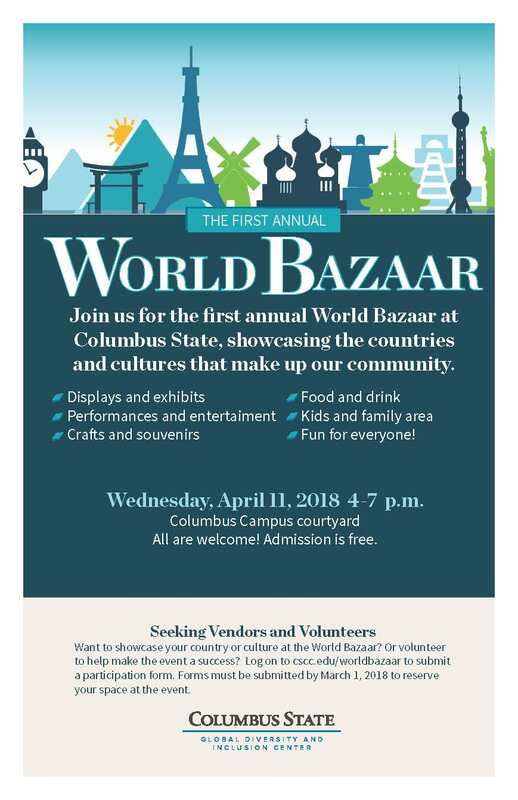 Log on to cscc.edu/worldbazaar to submit a participation form. 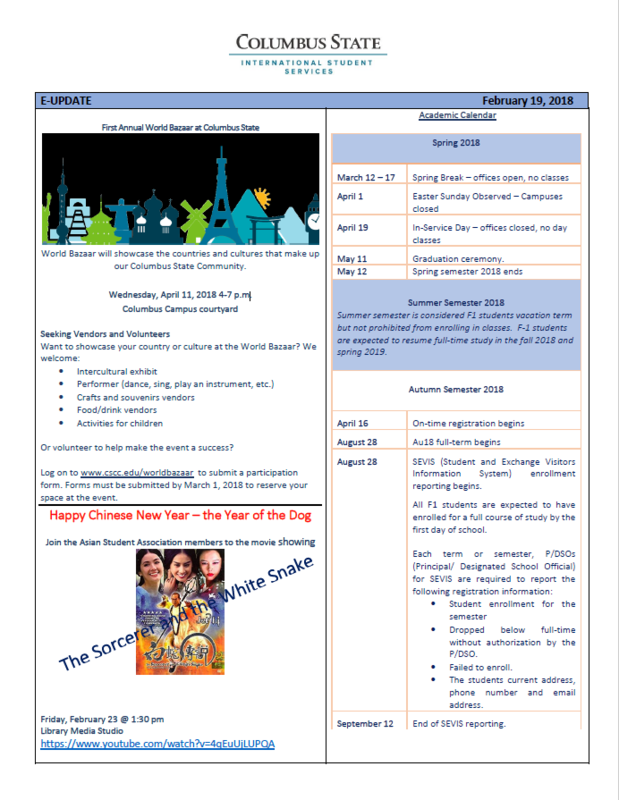 Important updates and information for current CSCC F-1 students for the Spring 2018 semester. A month-long celebration of Hispanic heritage and culture on the CSCC main campus including Film screenings, dance, music, food and other performances! See flyer for details. Mandatory orientation for all new and transfer F-1 international students who are starting this Autumn 2017 semester. Breakfast and lunch will be served. Scheduled presentations and activities end at 2:00 PM, additional advising time available from 2:00 PM - 4:00 PM. Orientation will be held at Nestor Hall, Room 013 (lower level). Click here for a map. Representatives from 12 Ohio universities will be in attendance offering information about transferring to their institutions. Open to the public, refreshments will be provided. Chinese Student's Association and the Confucius Institute present the Chinese spring festival celebration including dumplings, red envelopes, lanterns, paper cutting, Chinese knot, food and so much more. Lets celebrate together! Celebration will be located in the Media studio locating in the CSCC Library.